The Costa Mesa City Council meeting tonight, while less than two hours long, was not without it's moments. 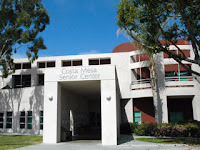 It started out with some unanticipated fireworks when resident Ernie Feeney - a grumpy person about my age - decided to attack the operations at the Costa Mesa Senior Center again. This time she was griping about a new policy regarding the use of the van that is used to take seniors to doctor visits. As usual, she launched her attack before the council during her 3 minutes of public comments time without having first looked for a resolution from the Senior Center Board. She rattled on and on and finally used up her time. Mayor Allan Mansoor advised her that her time was up, but she demanded another 15 seconds. Mansoor was adamant that she had used up her time and asked her to step away. Feeney, part of a geriatric scrooge team with her husband, John, refused and said she was going to stand right there for the entire meeting to get an answer to her questions, if necessary. Let me pause here to remind the readers that a few years ago another speaker, one Benito Acosta, objected when Mansoor cut his speaking time short. While he didn't refuse to leave the podium, he was dragged bodily from the chambers and arrested. His trial against the city and Mayor Mansoor begins in October. So, Mr. Mayor, do we assume that your friend, Ms. Feeney, is entitled to preferential treatment? She was even more obstinate than Acosta, yet you just let her stand there, defy your authority and interfere with the proceedings. Why didn't you have her dragged out of the chambers and arrested? I suppose a good lawyer will make a note of tonight's event for use in your trial. The next big item that came up was Mayor Pro Tempore Wendy Leece's announcement that, because of her busy schedule and job requirements, she is resigning as the council liaison to the Senior Center. I'm sure that news was met with a hearty round of cheers by many seniors in our city. During her tenure in that roll she has been an instigator of much unrest at the Senior Center. It looks like Ernie Feeney may have taken that baton from her, though. It will be interesting to see which council member is placed into that hot spot. It could be Katrina Foley, since she no longer has a business conflict. The Mayor and Leece, once again, showed just how they bow to the instructions of our city's racist laureate, The Mouth From Mesa North. During a discussion of some stimulus funds available for providing immediate relief for homeless renters, The Mouth told the council they shouldn't agree to the proposal and, bingo!, Mansoor and Leece indicated they were not going to vote for it. Since Eric Bever was absent from yet another meeting that would have meant a 2-2 vote - a de facto denial. Monahan saved the day when he made a substitute motion to bring the item back at the next meeting when all five members would be available. Mansoor demonstrated his Latinophobia again, when he expressed fear that these funds might be used for illegal aliens. What a guy - an easily-led guy. RED LIGHT CAMERAS ON THE WAY OUT? The council also heard from the Costa Mesa Police Department on the subject of red light cameras. After a long, but excellent, report everyone in the chambers understood that it would be the police department's choice to cease operating the red light cameras and ramp up targeted enforcement utilizing motorcycle officers instead. Very revealing statistics were used to support that choice. The council asked for this item to come back at a future meeting - probably the next one, depending on how the receivership hearing for the current vendor, Nestor Systems, goes on the 8th. 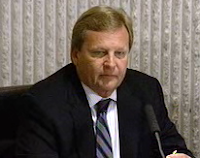 Also discussed was the method of replacement for departed Planning Commission Vice Chairman Jim Fisler, who left last week when he was appointed to the Mesa Consolidated Water District Board. The staff will bring back a recruitment action plan for the council to consider. It sounded like Fisler's seat might not be filled until October. Finally, fire officials seemed cautiously optimistic in the most recent briefings. Even though one fire alone, the Station fire, is over 200 square miles, the firefighters have big guns in their arsenal and progress is being made. Today we saw the DC-10, the 747 and the Martin Mars Flying Boat in action, joining dozens of helicopters and fixed wing assets. The Canadian Super Scoopers may be in action tomorrow. 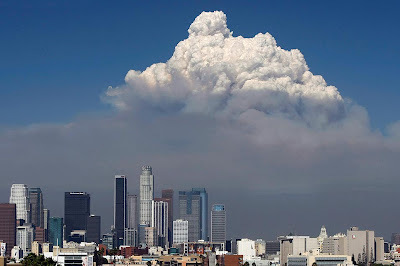 The Governor told us, one more time, that the state has plenty of money to spend on fires... good thing, since there are 8 separate fires burning throughout the state - most of which are within 200 miles of my house! Local television outlets did a much better job of providing information today. I guess they're worried about being knocked off the air if their antennae on Mt. Wilson are overrun by the fire. This afternoon that big Martin Mars Flying Boat made several passes, dumping thousands of gallons of water on the foliage surrounding the peak. I find it interesting that we are so worried about providing services to anyone if some percentage of the population receiving those services might be illegally in the country. If we follow that logic, why are we paying for fire, streets, sewers or any other service short of police. I leave police out, because we all know that some would like the police to enforce immigration laws.